If you’re looking for a local dentist experienced in providing gentle and friendly care to children, look no further than Rouse Hill Smiles. Not only does Dr Teena pride herself on offering an all-in-one dental practice for families, but as a mother of two children herself, she understands the kind nature needed when treating younger patients. As a result, children love visiting our facility, and we strive to offer a fun, safe, and stress-free environment for them. Don’t just take our word for it! Schedule your child’s first consultation with our practice today to see the Rouse Hill Smiles difference for yourselves! Many parents wonder at what age they should begin taking their infant to the dentist for regular check-ups. We recommend scheduling your child’s first dental visit around their second birthday, as this allows us to begin monitoring their oral health before any concerns turn into larger problems down the line. During your child’s first appointment, Dr Teena will examine their mouth whilst helping the child to feel relaxed and at ease. She will also educate your child in how they can maintain excellent oral health, along with providing brushing charts and showing them the correct method of brushing. Regular dental visits from such a young age will also help your child become familiar with the dentist, helping to ease dental anxiety and stress from the get-go. 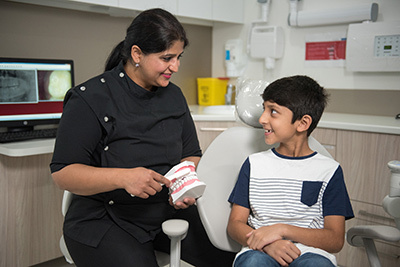 Dr Teena and her team ensure that a visit to Rouse Hill Smiles is a positive experience for both the child and their parent, filled with plenty of smiles, laughs, and of course, stickers! To ensure your child has the best chance at optimal oral health from a young age, schedule their first visit with Rouse Hill Smiles today. We provide gentle, friendly, and high-quality children’s dentistry that you just won’t find elsewhere!